Tommy Wright and Marcus Law are both set to give some of their first-team players more match action when Kettering Town and Corby Town meet in the first round of the NFA Hillier Senior Cup tomorrow (Tuesday) night. Steelmen boss Wright had planned to give the club’s academy players a chance to impress against their local rivals at Latimer Park. 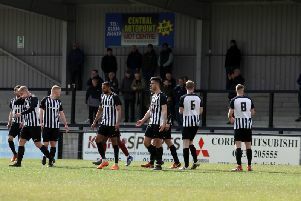 However, following the 3-0 loss to Worcester City on Saturday - Corby’s third Vanarama National League North defeat in a row - Wright is now set to get more minutes into some of his first-team players. But he insists he will “have to be careful” as the Steelmen are now also preparing for Saturday’s FA Cup second qualifying round clash with Rushall Olympic at Steel Park. “We have got to go back to basics,” the Corby boss said. “The majority of them will play tomorrow (Tuesday). There are a couple of injuries and we have a couple with tight hamstrings. “I have to be a bit careful because we have the FA Cup game next weekend so it will be a bit of a mixture for the squad. “I have got to give the fans a bit of respect and go over there and try to give them something back. Law, meanwhile, was unimpressed with the way the Poppies finished as they claimed a 1-0 victory at Paulton Rovers in the Evo-Stik Southern League Premier Division. The hosts ended the game with just nine men following two red cards but, in the end, Courtney Baker-Richardson’s first-half goal was all Kettering needed to wrap up the three points. However, Law is now also likely to give some of his first-choice players another run-out against the Steelmen as they also prepare for FA Cup action next weekend when they host old rivals AFC Telford United. “I wasn’t overly happy with the last 20 minutes of the game,” Law said. “So there are some players who were involved who will have a chance to put things right with their performances on Tuesday.